Proud moment for son of hero submariner Jamie Molyneux passes out at Welbeck. 10:03 Tuesday 12 July 2016. 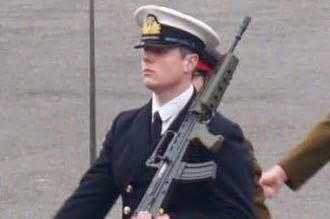 There was a mixture of emotions as the son of a murdered Wigan submariner passed out at military college. Jamie Molyneux, whose heroic father Ian was shot dead while serving on board HMS Astute in 2011, was also selected as the best naval officer cadet at Welbeck Defence Sixth Form College. Picture of Lt Cdr Ian Molyneux with his children, from top left clockwise, Arron, Jamie, Charlie and Bethany. He has been studying there since leaving St John Fisher in Beech Hill in 2014. The 18-year-old’s delighted mum Gillian watched on with pride as he passed out with his classmates at the weekend. Taken from an article published by the media WIGAN TODAY who own the copyright for the story. Thanks.